Kids are amazed and entertained! Why Hire MrGoodfriend, Kids Party Magician in Dallas? Kids love magic! And MrGoodfriend gives kids the magic they love! MrGoodfriend is professional. On time and ready to perform. MrGoodfriend (Derrel Allen) has been vetted (background checked) by Children’s Advocacy Center of Dallas, WATCH D.O.G.S. (Dads of Great Students) & the Allen ISD. MrGoodfriend is grateful you are giving this opportunity. And your kids will be grateful for having such a great birthday party! Sometimes, there is a lot of hectic motion surrounding a kid’s birthday party. Wouldn’t it be nice to be able to take a deep breath and focus on the guests, the food and decorations, and not have to worry about how to keep this group of kids entertained? What are you waiting for? 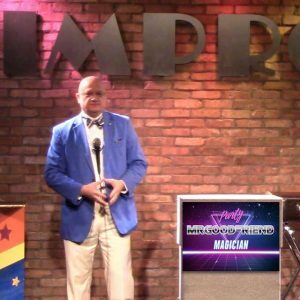 Get a birthday party magic show with Dallas magician MrGoodfriend now!